Pete Hines says Machine Games isn't interested in making a multiplayer mode for Wolfenstein: The New Order, and that's fine with Bethesda. It was kind of surprising to discover last month that the upcoming Wolfenstein: The New Order will be a single-player-only affair. Multiplayer action is traditionally a big part of shooters, after all, and shooters based on id Software franchises? It's practically mandatory. Yet according to Hines, Bethesda's vice president of PR and marketing, multiplayer isn't in Machine Games' "thought process," and that's apparently a-okay. "We're not going to force it down their throats and say, 'Well, the last games did, so you have to do it.' These guys do cool stuff," he told Eurogamer. "If you look at The Chronicles of Riddick or you look at The Darkness, those games have a creative element to them that is similar to the things they're doing in Wolfenstein and that's what attracted us to them, and that's what attracted us to their vision of Wolfenstein. And we said, 'Okay, run with that.'" Hines also put the kibosh on the idea of bringing in another team to take on the task. "We're not going to say, 'Oh, we'll find somebody else to do the multiplayer'," he said. "Wolfenstein: New Order is [single-player]. End of discussion." That's a pleasantly refreshing attitude, is it not? 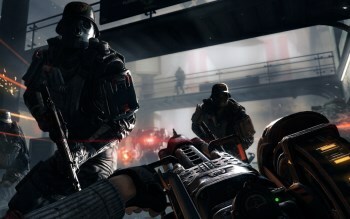 I dig shooting my fellow humans in the face as much as the next guy and I sunk a lot of hours into Return to Castle Wolfenstein multiplayer, but not every game needs an online component. Maybe it's a natural progression, driven by the proliferation of multiplayer-only games that are hitting the market with increased frequency; whatever the reason, if it means a better and more satisfying single-player experience in those games that choose to focus on it, then I'll be happier for it.